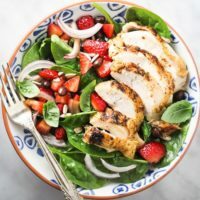 This spinach salad with chicken and strawberries is so filling that you can eat it like a main dish for lunch or dinner. 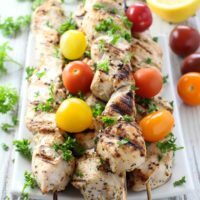 It’s a perfect meal for hot summer days because it’s light and you don’t need to cook anything. Just use leftover chicken or get a rotisserie chicken at a grocery store. What do you eat when the temperatures are so high that you feel like skipping meals or just drinking an iced cappuccino instead? And forget about cooking! Who wants to cook in this heat? 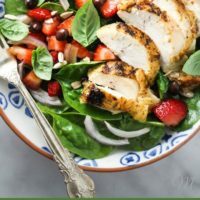 This spinach salad with chicken is my go-to meal whenever we are having a heatwave here in Toronto. 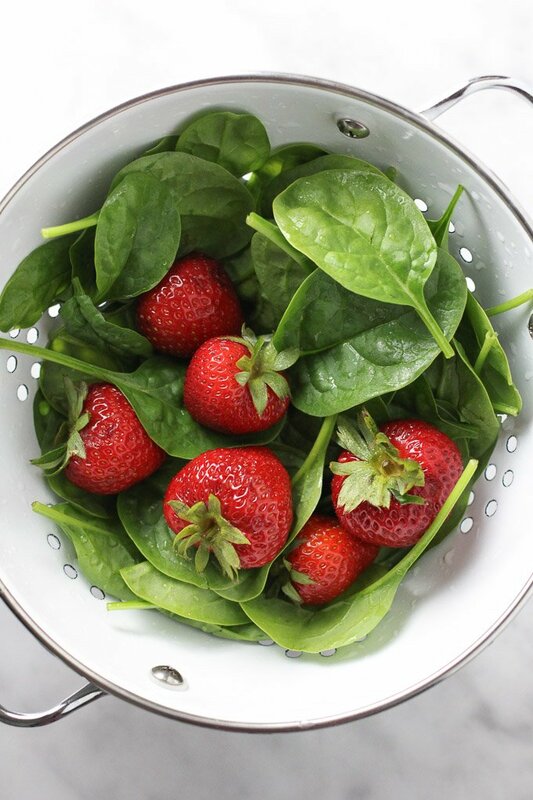 Aren’t spinach and strawberries a match made in heaven? They are so perfect for each other that it’s hard to think of a better salad base, especially during summer time. 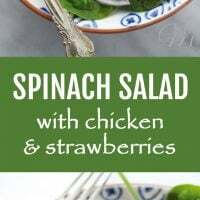 This spinach salad with chicken is also very versatile and you can easily adapt it to your taste and dietary preferences. 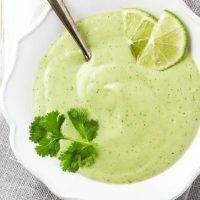 For example, you can make it vegetarian by skipping the chicken and adding hard boiled eggs or some soft mozzarella cheese instead. 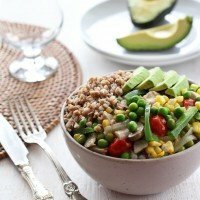 The vegan variation is also possible if you replace the chicken with beans. I also sometimes make this salad to be served as a side salad. In this case, simply omit the chicken. 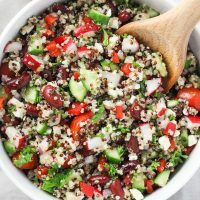 If you are looking for more recipes for hot weather, check out Mediterranean Quinoa Salad, this Cold Avocado Soup, and this Caprese Quinoa Bowl. 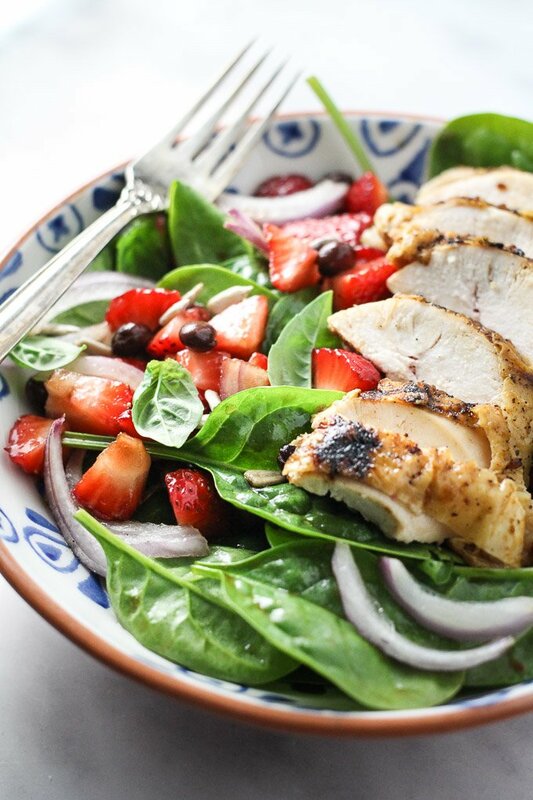 This Spinach Salad with Chicken and Strawberries is healthy, light and filling. 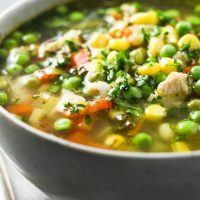 It’s easy and quick to prepare and is perfect for lunch or dinner. 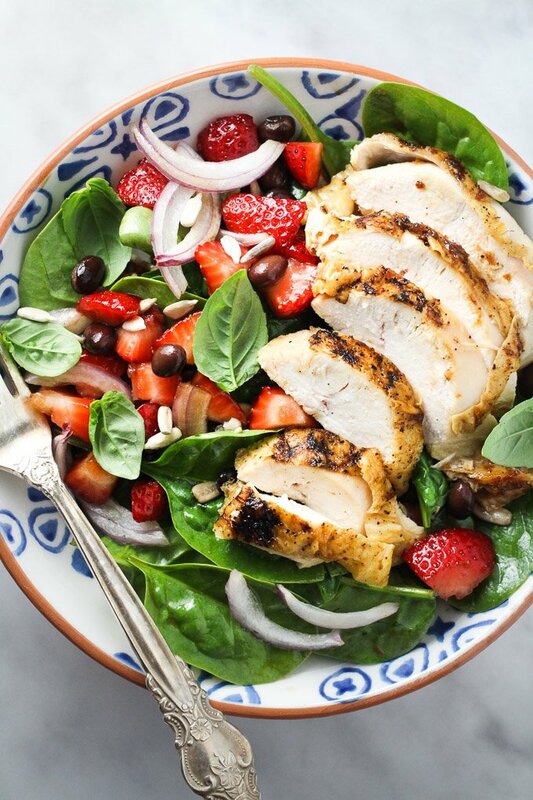 Place the spinach, strawberries, black beans, sunflower seeds and onions into a bowl. Add the balsamic vinegar and olive oil. Season with salt and toss. Transfer the spinach on to a plate. 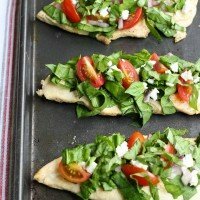 Arrange the sliced chicken and basil leaves on top. Alternatively, just put all the ingredients into a bowl, toss to coat with the balsamic vinegar and enjoy. 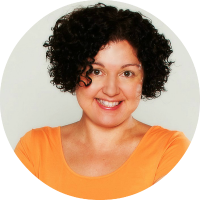 Nutrition information is a rough estimate calculated for 1/2 cup of chicken breast without skin.